C and R will admit, it did not look good for the Stanford Women’s Basketball team in the championship game. They made it to the finals of the Pac-12 Tournament, after losing to Oregon State in the regular season to lose a share of the regular season title, and wanted some redemption. With some good luck bouncing their way in the tournament, Washington losing in the earlier round, they breezed through Washington State and held off a pesky Oregon team to be here in the big lights. And their opponent? None other than the Oregon State Beavers, the team that had their number, beating them twice in the regular season (although it took double over time in the first match-up). So when the tip off happened, and Stanford faced the Beavers, Stanford found themselves quickly down, 16-3. This did not look good. Stanford did the same to the Cougars two nights ago, and they could never recover. Stanford was down 12-22 at the end of the first quarter. This match up was billed as two defensive-minded teams facing each other, but 12 points? Then, Alanna Smith to the rescue. The sophomore Aussie came off the bench to help Stanford slowly claw their way back in to this game offensively. She had 12 points for the half, and some good boards and blocks. Stanford found themselves *only* down 29-23 at the half. That score was somewhat misleading as OSU’s prolific score, Sydney Wiese, hit a crazy, banked-in three at the buzzer, even with Bri Roberson’s hand in her face. Okay, let’s talk defense for a moment. OSU had 29 points at the half. But they scored 22 in the first quarter. Stanford’s defense held them to just seven points in the second quarter, and Syd Wiese to just five points for the two quarters. Take away that crazy three and OSU is really hurting. Coming out of the locker room, after a quick peptalk/anger management session with their Hall of Fame coach Tara VanDerveer, the defense rose up again. Alanna got the start and Stanford tied it at 34 all with 3:24 to go on the third. The third quarter ended with OSU hanging on to a 36-34 lead. Let’s do some more math shall we? Oregon State only scored SEVEN points in the third quarter. That is not de ja vu. Or maybe it is. Let me rephrase, that is not a typo!! Stanford’s defense again came up big, holding OSU down, and Sydney Wiese to just eight points through three quarters. Fourth quarter, and it was all Stanford. But C and R you say in a high, falsetto voice, isn’t this where OSU’s scorer, Sydney Wiese makes her presence known and takes over the game? Isn’t this where she knocks down threes? Sure, C and R answer, she hit a three. ONE three. One three for the quarter. It was Oregon State’s ONLY field goal of the fourth quarter. They only scored SEVEN points in the fourth quarter. Of a CHAMPIONSHIP game!! The Beavers went 4-for-24 from the field over the final 20 MINUTES! And now I broke my cap lock button. Defense wins championships. Of which Stanford now has 12 of them. Pac-12 tournament titles. Of which is the most in conference history. And gets the Pac-12's automatic bid to the NCAA Tournament. And C and R continue their streak of incomplete sentences. Other notables, Alanna, the hero, had 18 points, including one 3-pointer for Stanford. Karlie Samuelson had 14 points, and made two 3-pointers. Erica McCall struggled under the basket, and OSU paid a lot of attention to her, and she ended the game with eight points and eight rebounds. Brittany McPhee also looked off and had six points and six rebounds, as Stanford must like square numbers. Syd Wiese for OSU finished the game with 13 points, below her average. C and R admired how she handled the handshake line, giving Stanford lots of respect, so we gotta respect her back. They will be in the NCAA tourney, for sure. Alanna was named to the all-tournament team, and Erica “Bird” McCall won Most Outstanding Player. 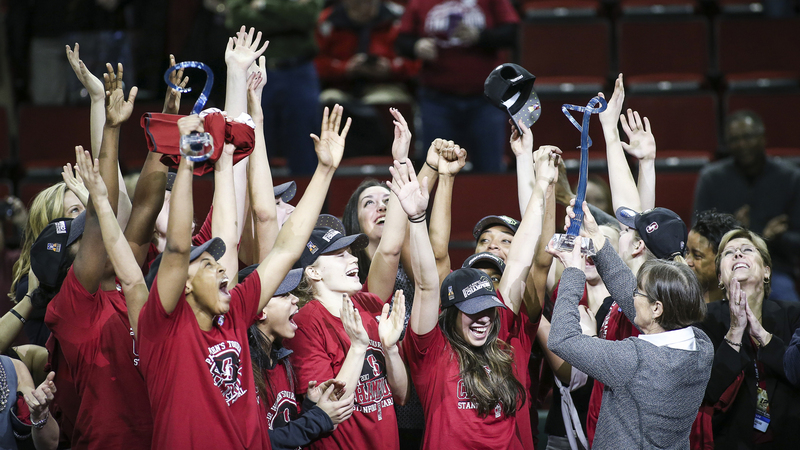 Stanford gets the automatic bid to the NCAA Tournament, although Stanford fans (such as C and R) don’t get to see them play locally as Maples Pavilion is hosting the Pac-12 gymnastics championships. Huge Bummer. Home field advantage is huge, and Stanford tends to play better at home. Looking forward to the March Madness!